PANAMA CITY, Fla. (AP) — A small village of the forgotten has popped up in Diahnn “Shelly” Summers’ backyard outside Panama City. Where there once was empty grass abutting woods, 10 tents now encircle a fir tree with Christmas lights. Some have been able to make their homes livable again with cosmetic repairs. Others left town: The county’s student population is down 14 percent. And 7,800 residents are still considered homeless, county officials said. Several obstacles prevent their return to normalcy. Trailers from the Federal Emergency Management Agency have been slow to arrive, and it’s hard to find an apartment where the rent hasn’t been jacked up in a suddenly tight market. Almost three-quarters of the damaged properties were rental units, which are difficult to replace with temporary shelter, Bay County Manager Robert Majka said. “If you have 100 units in an apartment complex, you can’t put 100 FEMA trailers into that apartment complex and accommodate these folks,” he said. She is looking for another place to live, but “everything is tripling,” said Shaw, who was fighting to stay in her Panama City apartment. Gregory found refuge with more than a dozen others living in tents behind Summers’ ranch-style house. Among the county’s homeless are 4,700 students, said Bay District Schools Superintendent Bill Husfelt. Some schools lost more than 40 percent of their students and the school board is closing at least three schools for now. “The velocity of FEMA’s temporary housing improved after the first of the year, although trailers … never came in consistently at stated goals,” said Joel Schubert, Bay County’s assistant manager. 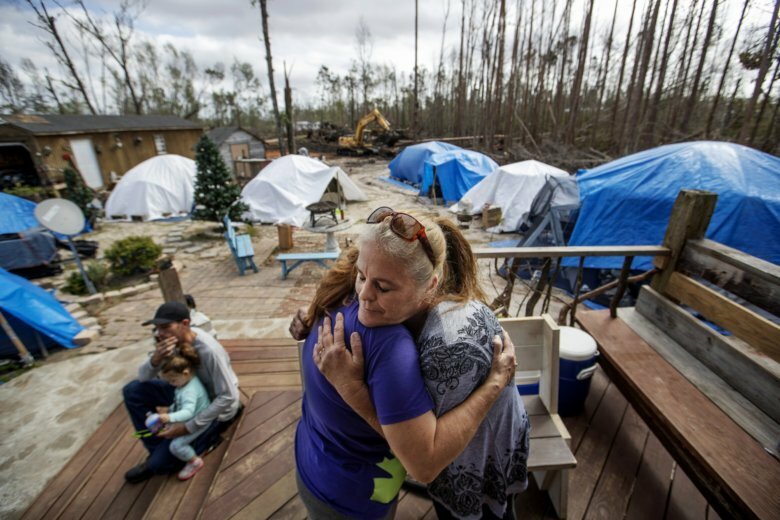 In addition, 26,000 Florida households received grants for home repairs, 21,000 residents received temporary rental assistance and 2,000 households were approved for hotel rooms or short-term condo rentals, FEMA spokesman Samuel “Carr” McKay said in a statement. Before she landed in Summers’ backyard, Jacinta Wheeler, whose apartment was damaged by the hurricane, joined other residents in an encampment dubbed “Tent City” in a different part of town. Officials forced them to leave over safety and hygiene concerns. Lori and Gene Hogan had settled in a tent on the beach after Michael destroyed their home, but police officers threatened to arrest them if they didn’t move, so they came here as well. Wheeler has been working construction jobs and helping repair neighbors’ properties while she stays in her tent.